Flame Choke (炎獄握, Flame Prison Grip) is Ganondorf's side special move in Super Smash Bros. Brawl, Super Smash Bros. 4 and Super Smash Bros. Ultimate, replacing Gerudo Dragon from Super Smash Bros. Melee. When used, Ganondorf charges at his opponent, similarly to Gerudo Dragon, but instead of uppercutting them he grabs them by the head and attacks them with a dark pulsing explosion, before the opponent is quickly slammed into the ground upon the explosion occurring. In mid-grab and while holding his opponent in his grip, Ganondorf has super armor, allowing him to, for example, snag a passing Wario off his Wario Bike while also preventing it from being interrupted. As a grab move, Flame Choke bypass shields and counters. Grounded Flame Choke also functions as a weak meteor smash, causing the opponent to weakly bounce upward and allow follow-ups such as Ganondorf's neutral attack (only on very large characters such as Bowser, Donkey Kong, and King Dedede), forward tilt, down tilt, and down smash (only on Olimar). When the move is used mid-air, both Ganondorf and the grabbed foe will plummet directly towards to the ground, which can cause a Suicide KO known as "Ganoncide". If Ganondorf performs this move in the air while going through a soft platform (half body above platform and half below), then he will grab the opponent and plummet below the platform (however, he has no knockback resistance in the air). Unlike the grounded version, the opponent is immediately floored instead of bouncing and the move has some ending lag, making it difficult to follow up, though the aerial version deals more damage. Also, when Ganondorf does the move in the air, he can slightly alter its path, slamming the foe more to the left, or more to the right. This makes it difficult to chase him off the edge, because as a last resort, he takes the opponent down with him. However, in Brawl Ganoncide causes a Sudden Death or a loss, which can be negated if Ganondorf is a stock/point up. Using this move on the ground with the opponent near the edge of the stage can meteor smash the opponent straight down off of the edge. However, this is not very useful, as it has set knockback and is too weak to prevent most characters from recovering with their up special move, and they will also grab the ledge if possible. If Ganondorf correctly predicts his opponent's get-up option after a grab, or uses mindgames to predict where his opponent will end up, he can re-grab his opponent, allowing the possibility of an infinite chain grab: this makes Flame Choke one of Ganondorf's most reliable ways of comboing his opponent, as it will setup for the same strings at any percentage. In particular, at low percentages. Ganondorf can follow with a down tilt and knock the opponent in the air, and then jump and catch them in another Flame Choke, and at high percentages, it will KO outright. Unlike Captain Falcon's Raptor Boost, this move does not cause Ganondorf to trip and fall if he misses on the ground. It does, however, still put him into a helpless state if he uses it in the air. Similarly, if Ganondorf is too close to an edge when he uses the move on the ground, he will instantly go into a helpless state and fall. However, unlike Captain Falcon, Ganondorf's slower falling speed gives him a chance to move towards the ledge and grab it (if it can be grabbed) before he falls to his death. In Home-Run Contest, the move will fail if used on the Sandbag: Ganondorf will pass through the sandbag just like any other grab-related special on any other item. The move was given an increase to damage and a larger grabbox, improving its damage racking capabilities and making the move easier to land while reducing the possibility of blindspots. However, the grounded version of the move is now techable, which can potentially negate follow-ups, though Ganondorf can still act very quickly and perform tech-chases. The super armor when grabbing an opponent was also removed, although still present when Ganondorf holds his opponent in the air. The aerial version was changed into a stall-then-fall, making it easier to steer backward, but covering less distance forward. This makes Ganonciding easier off-stage, but harder on-stage and adds more difficulty to return to the stage. Ganoncide also now KOs the opponent first, making Ganondorf always win when Ganonciding while he and his opponents are on their last stocks. Note that Ganonciding an opponent does not count as KOing them; credit for the KO goes to the last person to hit the victim. Enemies in Smash Run are not blasted downwards by the move, but instead away at a typical horizontal angle. The grounded version of the move's ending lag was reduced by 3 frames. This makes Flame Choke's combos more consistent while also allowing more possible follow-ups against missed techs, with down tilt or dash attack being a true combo against all characters. It also no longer dashes over an edge. However, Ganoncide's viability was significantly reduced. The aerial version of the move can now be escaped by button mashing, with opponents who have lower damage than Ganondorf being able to break out more quickly. In addition, Ganondorf is now KO'd first instead of his opponent, resulting him losing if he and his opponent are on their last stocks. "Rush forward to grab an enemy. Grabbed enemies will be thrown straight down." "Dash forward to grab an enemy and blast them into the air into other enemies." "Dash forward and strike enemies repeatedly rather than grab them." Flame Wave: Deals more damage and grabbed enemies will be launched into the air with high knockback with KO potential around 115% on the ground and 100% in the air, sacrificing guaranteed combos. Aerial version will still cause Ganondorf and his opponent to plummet downward and thus can still be used for Ganoncide. However, it moves slower, and has significantly shorter range and more start-up and ending lag, making it riskier in neutral than Flame Choke/Chain and more of a strict KOing tool. Knockback is similar to Gerudo Dragon. Flame Chain: No longer grabs enemies, but hits multiple times while dashing with horizontal knockback. Has longer range and a bit of traction on the ground, and can pass through shields. Will also stop at ledges instead of going off and leaving Ganondorf helpless - but this rarely matters as the player can simply hold in the opposite direction to grab the ledge and avoid an SD; however, if the player is using speed-boosting equipment they may go too far past the ledge to grab it, in which case this custom could be useful instead. Has slightly more start-up and significantly more ending lag. While its damage is around Flame Choke's with its grounded and aerial damage outputs swapped, it cannot KO until 160% near the ledge when DI and rage are not considered. 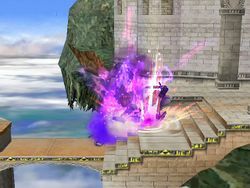 Ganondorf performs a similar rushing move in The Legend of Zelda: Twilight Princess that kills one of the sages who impaled him, though lacking the dark flames. In the GameCube version of Twilight Princess, Ganondorf uses his right hand, which is inscribed with the Triforce of Power, whereas in the mirrored Wii version, he uses his left hand, the latter of which is reflected in Brawl. Ganondorf holding the opponent in the air is reminiscent of him holding Tetra up by her throat in The Legend of Zelda: The Wind Waker. When using the Flame Choke mid-air, the consequential slam is very reminiscent of his ground-pound move from The Legend of Zelda: Ocarina of Time, making the reference twofold. Ganondorf killing the water sage in the Wii version of The Legend of Zelda: Twilight Princess. Ganondorf holding Tetra in The Legend of Zelda: The Wind Waker. Ganondorf using his ground pound attack in The Legend of Zelda: Ocarina of Time. The initial pose Ganondorf does before he rushes forwards in Brawl. Link falls out of the choke at the move's conclusion in Brawl. The move used as a meteor smash in Brawl. Ganondorf uses Flame Choke on Marth in Brawl. Ganondorf rushes forward in Super Smash Bros. for Nintendo 3DS. Ganondorf uses Flame Choke on Kirby in Super Smash Bros. for Nintendo 3DS. Ganondorf uses Flame Choke on Link in Super Smash Bros. for Wii U.
Flame Choke as shown by a Skill Preview in Ultimate. Despite the name, Flame Choke uses the darkness effect and not the flame one. It should be noted, however, that the darkness effect itself resembles a dark purple fire. Unlike some other side special grabs such as Force Palm, the player can't escape from Flame Choke even if the victim is giant. The whole screen shakes when Flame Choke is used on the victim. This is no longer true in Super Smash Bros. Ultimate. Aerial Flame Choke has Ganondorf holding the opponent upside down. However, upon landing, the opponent is strangely flipped. Depending which stage it's used on, the aerial variation may have different effects. On Norfair, Ganondorf can bounce in the lava but the trapped opponent doesn't bounce on it on the first hit. On certain portions of Port Town Aero Dive, it's possible to have Ganondorf survive while the other character is dragged off the screen. On other stages, both characters or neither may be KOd. If Ganondorf uses Flame Choke in an attempt to grab a ledge on the touring platform of Halberd he will ignore the ledge, go through the platform, and be left helpless, resulting in a very likely SD. If Ganondorf Aerial Flame Chokes an enemy and his size transformation (such as a Super Mushroom) wears off during the downward plummet, the move will automatically cancel and the opponent will be released, but Ganondorf will retain Flame Choke's momentum and continue descending downward rapidly. If Ganondorf Aerial Flame Chokes an enemy and somehow trips (such as landing on a Banana Peel), the opponent will be launched horizontally. In Hyrule Warriors, Ganondorf uses a similar rushing move. This page was last edited on March 6, 2019, at 22:49.